Brekkie of egg and French toast and we were on our way! This was going to be a leg which involved altitude! Deboche at 4400m and Leboche close to 5000m. Although already having climbed to 5100m, we were now on our way up! After 3 hours of walking along a contour path, we came to a tea house. Problem was it was situate at the bottom of a cliff! Towering above it was a zig-zag path, taking trekkers to just below 5000m. We enjoyed a cup of tea, before embarking on the slog. Again I concentrated on my breathing and drank as much as I could. 1 ½ hours later we crawled over the summit ridge to be met my shrines, plenty of them! This was the spot where shrines were erected to those climbers lost on Everest. I spent the next 40 minutes just walking around, reading inscriptions and trying to identify the person. I was amazing, certainly not a sad and somber place strangely enough. The most visible one was that of Scott Fischer, who died whilst descending Everest on the 10th May 1996. He was the leader of a commercial expedition and succumbed after he, and other parties, were caught out in a storm on the descent. Many books have been written about this tragic season on Mt Everest, amongst then Jon Krakauer’s “Into thin air”. On we plodder and arrived at our overnight stop that afternoon. With a bit of Wi-Fi, we were all able to make contact with home. Again dinner consisted of eggs and noodles! At this altitude and on the expedition, upset stomachs are a no-no! Go with the safe food and not the meats or salad type meals. The water up here is a problem, not very hygienic. We bought all our drinking water which was now at about R25 a liter! The higher one gets up the valleys, the more expensive things become. Not forgetting everything is carried in by porters and Sherpa’s! 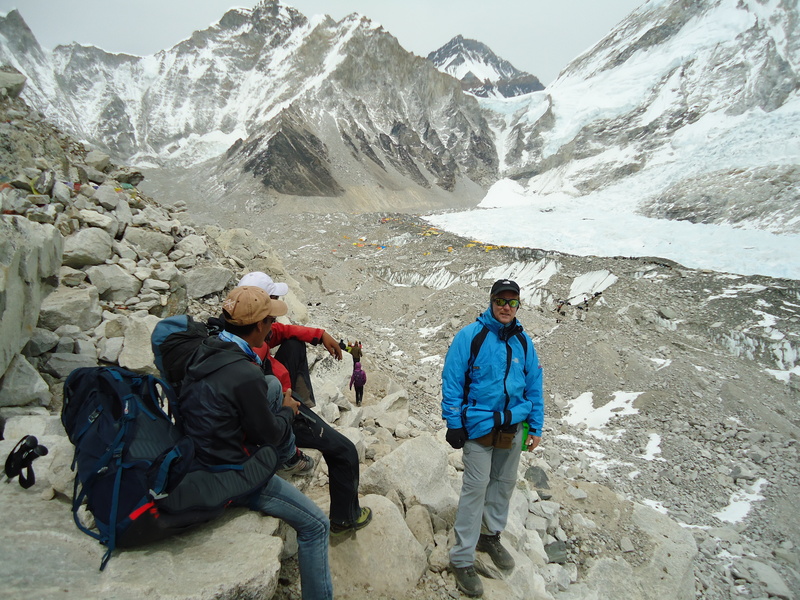 Sean had announced that we would now trek directly to Everest Base Camp. There was a planned night over in Gorak Shep, but as the trekkers needed to get back to Lukla to catch their flights back to Kathmandu, we wanted to spend some time with them at BC. It was a 10km trek, but again the altitude does not make it a pleasant trip! The climb was only about 350m or so, but it was a long day. We were now following the Khumbu Glacier, which started at the base of Everest and made its way down the valley. Under o it was mostly loose gravel and rocks. Vegetation was all but gone now. Just a few small shrub type bushes scattered about. I was surprised by the number of trekkers. Many were just going to BC to have a look about and then head on back to Gorak Shep. After rounding a corner, we picked up Everest BC about 2km ahead of us. It was positioned in a U type bowl, surrounded on 3 sides by huge mountains! A few yellow and orange tents littered the beginning of the Khumbu Glacier. This was going to be my home for the next 6 weeks or so!! A daunting prospect, but an exciting one! BC is pretty much set up on the Khumbu Glacier. Expeditions find themselves a suitable location and then carve out platforms for their tents. The glacier is constantly moving down the valley and where one may position a tent at the beginning of the season, is not necessarily where it will be at the end of the season! As we dropped down on to the glacier, we came across a Chorten set up at the entrance to the camp. A Buddhist shrine to those staying a BC for the season. Our Sherpa guide, Tensing, took us to our camp. It had been set up a week prior to our arrival and most of the tents and equipment were waiting for us. A quick explanation on the camp. We had a kitchen tent, where everything was cooked. Our BC cook was a chap by the name of Kami. We then had a mess tent, where we ate our meals. Alongside that was our communal tent, or “Zen Tent”. Although not equipped, it was to be our communal tent for relaxing and chilling after a day’s hike. We had blow up bean bags, a TV, music center, DVD player and coffee table. At the far end was the coms. Here we positioned all our radio equipment, computers and a charging bay for all cell phones etc. A table where I was to spend some time! Outside, and positioned around the communal tent were individual tents, one for each of us. Our rooms for our stay at BC. Away from the camp was a shower tent and toilet tent. Now the toilet was “primitive”. Inside this small tent was “starting blocks” as we refer to them. Rocks positioned for the position! As everything is taken out the valley, the toilet bowl was a drum. Once full, and by this time frozen solid, it was yakked down the valley for disposal. Lastly there was a tent for the staff and Sherpa’s. This was our home! That evening we had a great meal, of meat! Meat was now labeled safe to eat at BC! As it was the last night for the trekkers to be with us, we all sat around and reminisced on the long trek in. Next morning, as the trekkers prepared for departure, the Barns family had arranged their trek back to Lukla in style! Andrew had chartered a helicopter to take him, his wife Shannon and son Reece all the way back to Kathmandu! The chopper arrived and they took off in style! The rest packed their bags and set off on the 3 – 4 day trek back to Lukla. Problem with a few of us, me included was the altitude. We were starting to feel the effects. I had begun to suffer from headaches the previous evening and the whole of the next day I suffered! I took tablets and just tried to take it easy. However they would not go away and into that night and the next morning, I was still suffering! From the outset, I knew this would be my Achilles heel on the trip. Twice whilst climbing Kilimanjaro, I had suffered badly from the effects of altitude. For some reason my body just would not adapt easily to altitude. Physiology, why are some effected and others not? I had taken every precaution. I had drunk and eaten regularly, I had breathed my way up every incline, adopting the “Wisedale Shuffle”. I walked extremely slow and avoided taking when on an incline. I had done everything by the book, but here I was in BC suffering the effects!! For 3 days I took tablets and drank what I could. On the 9th April, we all sat about and chilled for the day. This was our first day with just the 5 of us. Sean took a walk to Gorak Shep whilst the climbers prepared climbing kit for Island Peak. With my altitude issues, I was not sure if Island Peak was going to be a happening thing for me! We’ll see how I feel in 2 days’ time. Big new was that tomorrow, we would be having our Puja. This is a small Buddhist ceremony for each of the climbing expeditions and a blessing by the Lama on the teams for a safe passage on Everest! Before a Sherpa will step foot on Everest, they need to be present and blessed by the Lama at the Puja. Each climbing expedition has their own Puja. A stone cairn is built and the Sherpa’s all prepare for the big day. A lot goes in to it with flags being prepared, food, candles and other merchandise for the big day. I even saw a few beers on the list a d a bottle of local rum! Once all is ready, we sat back and waited for the Lama to arrive. At about 2pm, having finished another Puja, the Lama arrived at our camp. He was not dressed in a traditional Buddhist monk outfit, because of the cold, but down jacket and pants! He had with him a cloth roll. The ceremony got stated and the Sherpa’s all gathered around and acted on command from the Lama. Water was sprinkled, rice was scattered and the chanting went on for a good 1½ or so. Our kits was brought out, sprinkled and blessed. They even rub a small amount of butter on a few climbing items. Then the flags came out. At the center of the cairn, was a long metal pole. From this pole the flags were attached and then fanned out to various points around the camp. Some must have spread a good 30m or so. At the end of the ceremony, foods were brought out, many of which I had never seen or tasted before! To end off a cup of beer and taste of rum!! With the Puja now done, the Sherpa Team were ready to enter the ice fall! ← Island Peak – The Summit Attempt!